ORANGE- Shirley (MacKnight) Bundy, 100, of Bacon Street, died Sunday, April 7, 2019 at the Alliance Health at Baldwinville. Born on September 22, 1918 in North Orange, she was a daughter of the late James and Lillian (Lawrence) MacKnight, and grew up in Orange, graduating from Orange High School in 1937. Shirley was married to Gordon C. Bundy on December 21, 1940, and enjoyed over 43 years of marriage until his death in 1984. 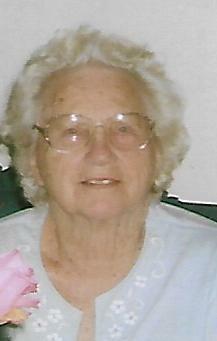 Shirley retired from the Slencil Company in Orange and had previously worked at the former Minute Tapioca Company. A 4-H leader, Shirley had also served as a Brownie Mother. Shirley enjoyed sewing, gardening and making crafts for holidays. She loved vacationing with family and friends in Maine and Florida, and later traveled to Hawaii, Canada, Ireland and all across the United States. Shirley looked forward to meeting old friends each year at the Orange High School Alumni Reunion as well as the Orange Senior Center. Most of all though, Shirley loved being with her family just for a visit, special occasions or the grandchildren’s sporting events. Survivors include a son, Dennis Bundy and his wife, Paula, of California; daughters, Cheryl Metevier and her husband, Greg, and Luanne Goguen, all of Orange; grandchildren, Karyn King, Mark Metevier, Lianna Brooks, Daniel Boucher, Christopher Bundy and Heather Bundy; three great grandchildren; a brother, Richard MacKnight of California; and many nephews and nieces. Besides her parents, Shirley was predeceased by her siblings, Grais Mullen, Verna Sweet, Erma Spencer, Kenneth MacKnight, Paul MacKnight, Leon MacKnight, Edwin MacKnight, Harold MacKnight and Evangeline MacKnight. A calling hour will be held from 1-2 p.m. on Sunday, April 14th at Witty’s Funeral Home, 158 South Main Street, Orange. A funeral service will follow at 2 p.m. in the funeral home, with Rev. Dr. Megan Leary of the Orange Central Congregational Church officiating. Interment in South Cemetery, Orange, will be private.